The Ayau and Asia Islands are remote and beautiful island groups, lying amid picture-perfect and rarely visited Pacific atolls. The Ayau Islands are about 50 kilometres north of the northern Waigeo village of Kabare, and the far smaller, uninhabited Asia atoll is truly remote, being a further 70 kilometres north of Ayau. If you’re looking for an adventure in an essentially undeveloped environment, staying in family homes with people who are going about their traditional lives, then this is for you. You’ll need to have a strong sense of adventure to make the journey to Ayau, and being able to speak Bahasa Indonesia would be a definite advantage: English speakers are not common in the islands at all. Additionally, you’ll need to carry in your snorkelling gear and anything else you consider essential, as only very basic commodities are available in island stores. If you’re a surfer on a mission to find the world’s last unnamed breaks, Ayau and Asia should be high on your list of places to check. 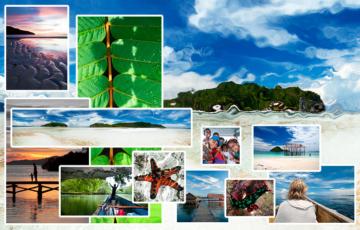 We’re often asked if there is any surf in Raja Ampat. We have never seen or heard of any, but satellite images of Ayau and Asia suggest they’d be serious contenders. Both atolls are wide open to the Pacific swells and have miles of fringing reefs outlined in breaking waves. There are a few choices. We’ve ranked them below from cheapest to most expensive. (i) By Perentis boat from Sorong as described in detail in Lorenzo’s trip report (see below). (ii) By public boat from Waisai harbour to Kabare, then by chartered boat to Ayau. In April 2017, the KM Marina Express departed Waisai harbour for Beo Island in Mayalibit Bay and then on to Kabare. At that time, the boat was leaving Waisai every Monday and Friday at 0800, and departing Kabare for the return trip every Monday and Friday at 2300. (iii) By air from Sorong or Waisai to Kabare, then by chartered boat to Ayau. (iv) By chartering a boat from Waisai. If this is your preferred option, the Waisai Homestay Information Center should be able to help you find a suitable boat. (v) By chartering a boat from Sorong. Given that it costs hundreds of dollars to charter a boat from Sorong to Waisai, we’d hate to think what it would cost to take one to Ayau, but it’s another option if your time is limited, but your budget is not. We’ve been trying to organise a visit to Ayau and Asia for years, but have either run out of time on each visit, or else the weather has been against us. 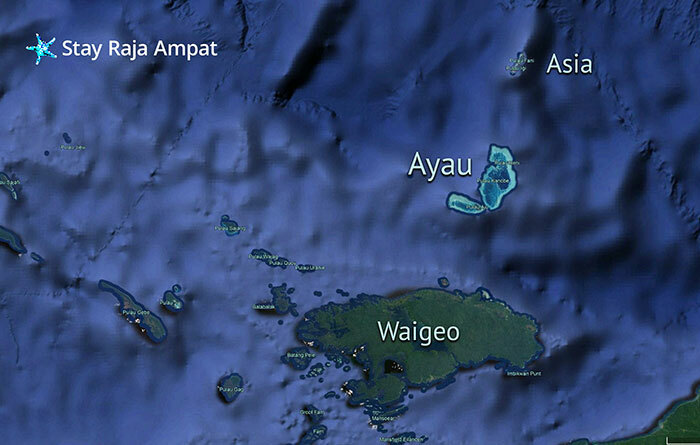 Ayau is the common name for a bunch of islands north of Waigeo. 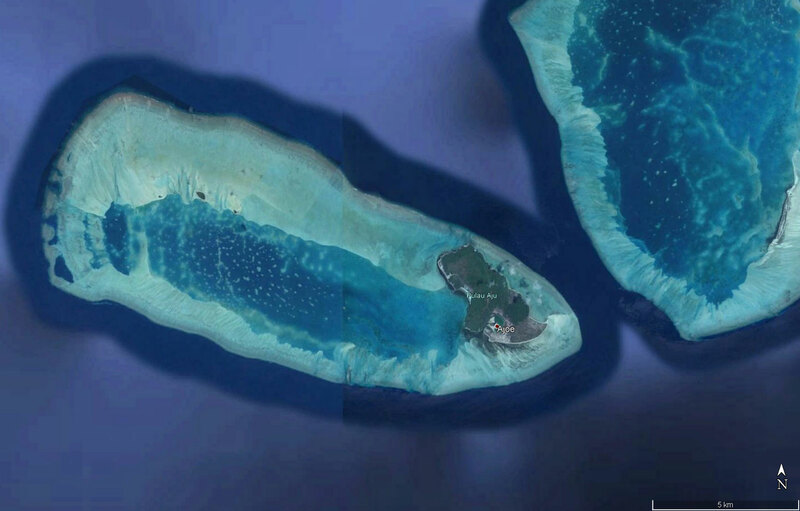 If you go to Google maps and switch to Satellite view, you will realise that they are in fact two atolls. Two Pacific Ocean, Tahiti-grade beautiful atolls. Locals refer to them as Ayau Kecil (“Small Ayau”) and Ayau Besar (“Big Ayau”), the former being the westernmost one, the latter the bigger one. For the sake of simplicity, I’ll refer to them as east Ayau and west Ayau: this is just my own way of calling them, it’s not on any map or reference source. 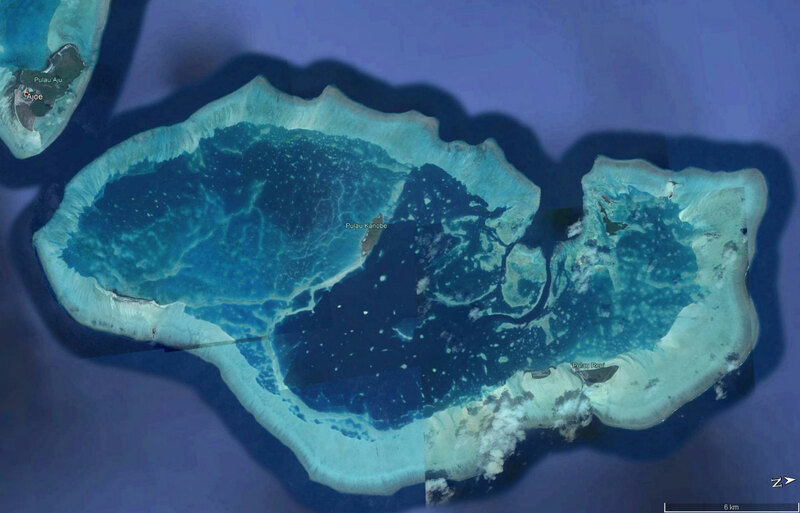 Most of the times, locals name just the islets that dot the outer reef ring (the ‘motu’, in Tahitian). West Ayau has just one inhabited islet: it’s commonly called Dorekar, after the name of the main village; there are two more villages on the same speck of land: Yanfankan, about 3 km along a path to the west of Dorekar, and Yenkawir, about a km past Yanfankan, at the westernmost end of the island. 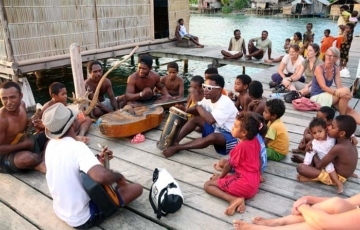 When people go to the Ayau Islands, they normally specify the village they are going to, rather than saying “I’m going to Ayau”. Dorekar is the largest settlement and is home to government buildings and even a branch of the Bank of Papua. The western Ayau atoll comprises also three tiny islets called Urbabo, Urbabo Kecil and Urmasasi. Two of them are home to fishermen’s temporary shelters, while the smallest is a designated no-catch area based on local sasi tradition. Electric power is available through the new and extensive grid, but only when the local government has enough money to buy fuel. During our stay, power was only available via private generators and privately-sourced fuel. East Ayau is way bigger; there are four inhabited islets: Abidon (or Kanobe on Google maps), Reni and adjacent Rutun, and Mios Bekuan (“Long island” in Bahasa Biak, the language spoken by the islanders). At low tide, you can walk among the four islets: a long, snake-like sand bar connects the villages; the time required for the complete tour is probably significantly longer than tides allow, which means only the Reni-Rutun crossing is feasible. Abidon is the only one without fresh water wells: Because the huge desalination plant is broken, the only source of water is rain. Due to one of the more and more common paradoxes of the modern world, there is LTE internet signal which is missing altogether in Yenkawir and only partially available in Dorekar and Yenfankan (more details about phone and internet connection later). The tiny and highly scenic Mios Ros lies east of Mios Bekuan. At present, it hosts only a sea cucumber farm. 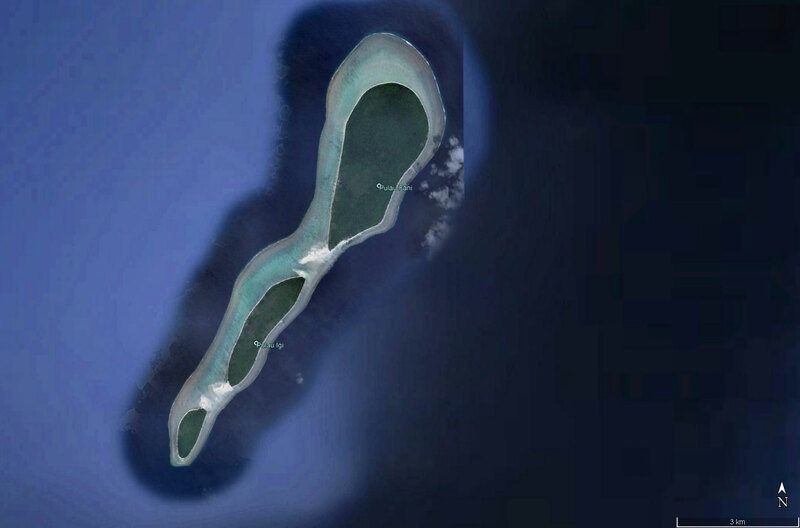 The northern part of East Ayau is made up of a group of islets collectively called Mios Mandun and a bigger island called Kanover (also called Kanobe on Google maps: Confusing!). They only provide shelter to birds and bats. The nearest landfall to Ayau is Kabare, north Waigeo. Private boats depart whenever they are chartered. You can charter a boat also from Waisai in southern Waigeo or from Sorong. They tend to be expensive if you don’t share with other visitors or locals. 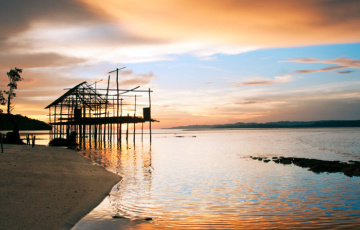 The cheapest way to get here is to board the Perintis boat called Mitra Papua. A quick introduction to the “Perintis” fleet might be handy: The Indonesian government runs two fleets of vessels whose routes criss-cross the archipelago, Pelni and Perintis. Perintis means “Pioneer”, a name that does not immediately summon memories of luxurious accommodation and food. Boats belonging to this fleet are in fact cargo boats, sometimes adapted to carry a limited number of passengers, usually out on the main deck. They are notorious for their unreliable schedule and lack of hygienic certifications. The Mitra Papua however has a fixed weekly schedule and is kept relatively clean by both 1 of the 3 crew and the passengers: You will see them happily throwing overboard all kind of garbage, mostly plastic and other modern pollutants. Note that the trip to Pulau Fani is only done occasionally, when requested by the navy base, and then only if weather conditions allow. The naval base on Pulau Fani is the only settlement in the Asia Islands. 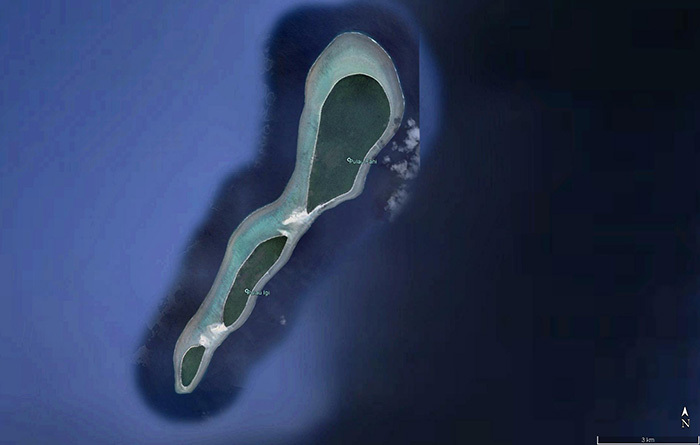 Fani is one of three islands in the Kepulauan Asia atoll. If the boat does not go to Fani, then the departure on Monday morning is delayed until about 9am. After reaching Ayau around 12noon and staying at anchor about 2 hours, the boat goes back to Kabare and Sorong as per above schedule and times. There are no passenger cabins. You can ask around for a crew member who is willing to rent out his bed (the crew is male only, sorry :). The trip from Sorong to Kabare is about IDR 300,000 and about 500,000 to Ayau. Alternatively, you can do as everybody else does and sleep under the thick tarpaulin on the main deck at the front of the boat, or on the smaller space on the upper deck at the back of the boat. (A tarpaulin provides shelter there as well, but the noise from the main engines and the generator is hard to ignore). No food is served onboard but you can buy noodle cups and “cook” them with the hot water provided free of charge. You can also buy cookies onboard, or buy your food before boarding. True to its nature as a cargo boat, the Mitra Papua carries all kind of wares: From heavy sago “cones” to hundreds of sacks of rice, to chickens, scooters and pieces of furniture. Less legal items such as black coral, shells and lots of parrots and parakeets abound as well. There are a total of 4 wooden cabins in a few of the islands (at the beach behind Dorekar, and at the beach on Long Island). They are ready and the local government might decide to open them up to visitors some day. For the moment, the only alternative is to find a local who is willing to host you. I met Richard, a guy from Yenkawir, on the Mitra Papua. His English is basic so we got along in Bahasa Indonesia. I paid IDR 300,000 per night with 3 meals included. I stayed in his house in Yenkawir for about 10 days; two nights we stayed in Abidon, near a Conservation International (CI) office. Accommodation is in a local house, which I loved. Just to make sure you know what to expect, in Yenkawir the rats made a lot of noise every single night (every single moment, it felt like :) ) I only saw one once in the kitchen, but I heard them loud and clear – bring your ear plugs. In Abidon, we slept with the generator on the whole night because the islet is home to small, non poisonous snakes with the questionable habit of entering the houses and rolling up sleeping people’s bodies. On the bright side, not one rat was to be heard – I didn’t see any of the snakes either. Bring your…??? Staples are rice and fish. Vegetables such as papaya flowers and leaves were servedevery day. Fruit was absent for the first 10 days, then Richard found some bananas and2 or 3 papayas, all of them very tasty and sweet. Coconuts abound but tree climbers are scarce, so we often got coconuts collected from the ground rather than the real thing. Pulau Reni has tiny coconuts that are the sweetest we have ever tasted (previous number one spot was occupied by the chestnut-shaped Thai coconuts). All villages have one or more shops where you can buy cookies, noodles and other common stuff such as band aids and super glue. On west Ayau, the village of Dorekar has wifi via a solar-powered system. It was fixed while I was there, so I could use it during the last few days of my stay. It’s 3G with good speed: I downloaded and sent emails and checked for my flights but couldn’t buy any tickets. No phone signal is available because the Telkomsel tower has been broken for two years. As for the other two villages on east Ayau, Yenfankan (the nearer to Dorekar) should get some wifi signal: I haven’t tried personally. Yenkawir doesn’t get any signal: In case of urgent need, jump on a boat and in less then 5 minutes you are in Dorekar. There is no phone signal in either village. On east Ayau, the main islands of Reni and Rutun get both phone and internet signal. It’s LTE at very good speed. Again, all I did was checking emails and a few other travel related websites: the speed was ok for those tasks. In Abidon, if you go out to the pier you can catch the signal from Reni: same as above. In Mios Bekuan, you can get the Internet signal only at the very northern tip (closest to Rutun) by climbing on a tree :). The phone signal seems to be better but I haven’t tried it personally. Both atolls have plenty of beautiful beaches and sand banks. Snorkeling is good particularly in the outer sea: Richard has worked as guide for NGO so he knew what foreigners expect. Only a small area has dynamite damage, the rest is pristine hard coral for as long as you can snorkel. Fishes come in huge schools, small bali tip sharks pop up regularly but ins very small number. In fact, one specific area is off limits to tourists because the local community actively fish for sharks. Turtles are very few and incredibly scared not just by the boat engine but even by the sight of a snorkeler: every single village has a turtle pen, a small palisade where live turtles are kept before being eaten; all the pens were empty at the time of our visit, but we did see a dead turtle being carried along a pier, and kids killed two tiny juvenile sharks during a snorkeling trip (we were taking aerial pics and only realised what the prey of the screaming pack was when it was too late). Mantas are seen at specific times of the month according to tides. We had 3 encounters with one manta during one half day tour. The islands are small enough that you can walk around each of them within a few hours. We spent most of the times at the beach or in the water so we missed out on the trekking. Sunday is prayer day which means most people just relax and socialise. The majority of the inhabitants are Protestant Christian. We organised a speed boat to visit Pulau Mot (aka Pulau But). It cost about 100 Euro in fuel. The islet is isolated and remote by any standard. However, the crumbling state in which the CI hut rots away means that the 20-year period during which the turtle nesting grounds were guarded is over. The obvious result has been a free for all eggs & turtles bonanza. Snorkeling is good, the beach is awesome and all to yourself. Bear in mind that Richard only has very basic English, and lives in an area where telecommunications are difficult. Richard’s number was correct in April 2018, but phones often get dropped in the ocean and numbers changed. Thanks for the guide. I was looking at this area first time I was researching about RJ. Now I have more confident with the details plus.. I am internet warrior so those phone signal and 3G info helps.